Pelican Products:C - DA, Devereaux D. Cannon, Jr.
Devereaux D. Cannon, Jr. is a seventh generation Tennessean. His ancestor, Devereaux Gilliam, settled in the Tennessee country in 1785. It comes as no surprise, then, that he has had an avid interest in history since his early childhood. As a child, his interest led him to be an active member of Children of the American Revolution and Children of the Confederacy. As an adult, his fascination with history has led to an interest in politics as well. Cannon, a lawyer, has been an alternate delegate to a Republican National Convention, a candidate for the Tennessee General Assembly, and a member of the Planning Committee for Nashville Jefferson Meeting on the Constitution. His interest has also manifested itself in his books. His books, in turn, have earned this avid flag collector much respect as a historian and vexillologist. The Wall Street Journal called The Flags of the Confederacy "the last word on the flags of the lost cause." Cannon is currently a member of the Sons of the Revolution, the Military Order of the Stars and Bars, and the Company of the Confederacy. He has also held numerous local, state, and national level offices in the Sons of Confederate Veterans. An active Civil War reenactor, he resides in Nashville, Tennessee. Home » by author, illustrator » C - DA » Devereaux D. Cannon, Jr. The three stars on the Tennessee flag represent the three cultural divisions of the state—the “Grand Divisions”—East, Middle, and West Tennessee. Though culturally distinct, the three Tennessees share a common history of exploitation of colonial lands by Spanish, French, and British claims. For many years Tennessee was under the dominion of these flags. The classic guide by Devereaux D. Cannon, Jr. has been updated and given a fresh new wash of color by noted Civil War artist and historian Alan H. Archambault. With twenty additional flags and graphics illustrating the common types of finials used on Federal flags, this beautifully colorized edition is a must for Civil War historians and flag enthusiasts. With an updated guide to the the history and development of flags in the United States leading up to and during the Civil War, Archambault’s research and short descriptions pick up where Cannon left off. The Wall Street Journal called Cannon’s companion volume, The Flags of the Confederacy: An Illustrated History, “the last word on the flags of the lost cause”; this volume continues that tradition, featuring banners from the different armed forces and their divisions from fleets to cavalry units to infantry corps. 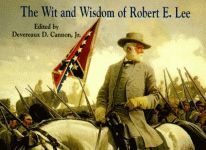 A man of complex dichotomy, Gen. Robert E. Lee, leader of the Confederate States Army, was also a devout Christian, devoted husband, and father of seven. Lee’s opinions on life, family and children, women, politics, Yankees, and war are collected here, many taken from his personal letters. Paperback.